This was another free download from Kindle and I really quite enjoyed it! It's steampunked Canada set in the 1890's. Kali, a tough talking and super intelligent inventor is building a steam powered sled for the upcoming dog sled races. Unfortunately, she's also the daughter of a dead alchemist who found out how to make the mythical flash gold. 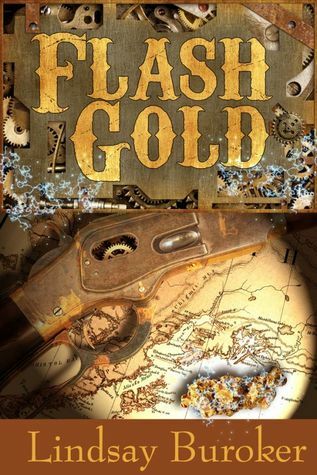 With a huge bounty on her head and all sorts desperate to get hold of the flash gold, a mysterious stranger tries to help her, and Kali has to overcome challenges to try to win the races. This will be another mixed review I think. I was pleasantly surprised with the novel. The writing was pretty good, the sentence structure tight and the story line propelled at a good pace by the author. As there was not the same type of finish that one expects from mainstream authors, I assume that this book is by an 'indie author'. Although I enjoyed the novella, and was definitely surprised, I found the characters quite cliched. I know, that may sound harsh, but it the was the same story just in a different setting... tough talking, I don't trust anybody, super intelligent main female character, being aided by a talk, dark stranger, with a troubled past... until eventually she drops her defences and well, I can just guess what will happen in the sequel. Granted, many people enjoy reading those types of characters - and I do too! But I would have loved to see more be done with these enigmatic characters. The storyline is pretty tight and I have to say Buroker has definitely done a great job in making me want to get a hold of the sequel 'Hunted'. I'll definitely be visiting the world that she's created again to see what happens to Kali and Cedar.